Make sandwiches as fast as you can prep the buns! Can I cook hamburgers without a grill? YES! The Instant Burger cooks with a “Direct Energy Transfer” system. No grill is necessary and cooks burgers in 25 seconds. “Direct Energy Transfer” What is that? The Greatest innovation since the hamburger! It transfers the energy directly through the meat, cooking the meat to over 180°. The cooking process takes place inside the meat. What are the installation costs? None! 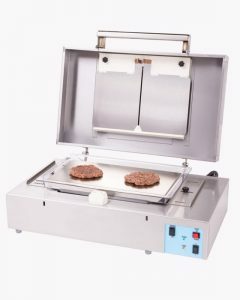 The Instant Burger is portable and takes only 23″ x 16″ of counter space on a 30 amp dedicated circuit. With no installation costs do I need a venting system or expensive hood? NO! the cooking plates do not get over 200° F. Therefore, no grease is burned and no vapors or smoke is emitted into the air. Please check your local codes. Do I need to hire a cook or someone with cooking skills? NO! the Instant Burger automatically cooks each item and will not burn the meat. This eliminates human error and wasted time because your employee can do other things during the cooking process. Can the Instant Burger cook other entrees? YES! Chicken filets, Cajun flavored chicken filet, hamburger steak, fresh ground pork steaks, turkey patties, hot dogs, and sausages to name a few. 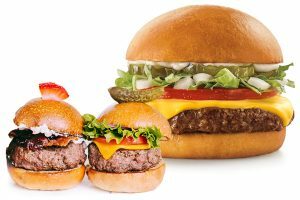 Enhance your menu with delicious and healthy entrees all on the Instant Burger!